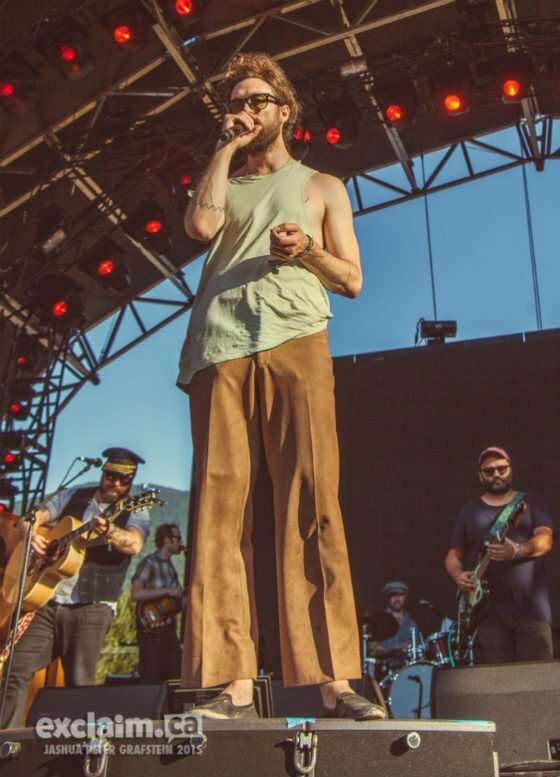 Within one minute of Edward Sharpe and the Magnetic Zeros taking the Mount Currie Stage, the field was rushed and Alex Ebert himself jumped into the pit, singing amongst fans and running the entire length of the barrier, mic in hand. A beautiful lyricist, amped by the power of a massive backing band, they dropped right into "40 Day Dream," throwing down the feel of an impromptu jam band, Ebert looking as if he'd just come from the Pemby campgrounds. Dropping into the crowd once again, Ebert tried to pass off the mic to anyone willing to fire off a few rounds of lyrics. After a fan's woeful tale of a missed show in Saskatchewan and a bout of silence from another, one guy finally took the mic, firing off four nearly incomprehensible verses, yet gaining full support from the crowd. The set was made intimate by the band's disposing of formalities, Ebert sitting on the edge of the stage for the most part, interacting with the crowd at every opportunity, the massive rotating band working a crowd double the size most acts at the festival have garnered.